In the company of an unparalleled roster of award-winning professors from a range of disciplines, you'll get fresh perspectives on books you only thought you knew - and intriguing introductions to some works you may not have known played key roles in getting us to where we are today. These include The Analects, the Liber Abaci, A Dictionary of the English Language, The Jungle, The Feminine Mystique, and more. If you've taken another course with these professors before, get a reminder of just why you enjoyed them. And if you've never heard some of them before, who knows? You may just discover your next favorite Great Courses professor. More than that, you'll rediscover just how powerful the printed word can be. You'll also learn how the mark of a truly great book isn't that it just changes the lives of individual readers-but the lives of entire civilizations. Like many of this type of series the trouble here is the mashing together of lectures from different studies. Some of the lectures are fantastic, but some make many references to classes you haven’t heard, and some don’t really talk about the impact of the book, just the characters with. Would you recommend 36 Books That Changed the World to your friends? Why or why not? The 36 different lectures and lecturers is a bit patchy -- some hold up as informative and delightful individual excerpts, while too many are obviously meant to be connected to the larger course. Too many are not actually about the book but rather fill in sideline tangents and other minutia. I think it is the format. I was expecting more about the actual texts and the writers. A few stand outs -- Francis Bacon, The King James Bible, The Confessions. Cut and Paste version will disappoint!! This and its companion 36 Revolutionary Figures that Changed the World, is a compilation of material created for clearly different purposes and then pasted together under a flimsy rationale. I bought both, excited by the potential, but was very disappointed. GREAT COURSES has produced many excellent, educational and informative lecture series - this is NOT one. I have purchased literally dozens of Great Courses, but this one is a knockout because each book is analyzed by an expert in his or her field. So not only is there a fresh "take" on how to look at an important book in each chapter, there is also a variety of voices and delivery styles to keep the course fresh from start to finish. There has been more than one occasion where the droning, monolithic presentation by a completely un-charismatic lecturer has all but killed my interest in a topic, let alone my desire to plough on. I applaud The Teaching Company for using this outstanding format. I learned much & added Books to my TBR list. I miss college. I will always miss college. I miss listening to professors share their passions about people of history, places in time, concepts, and books. This collection of short lectures were intriguing and I enjoyed each one. If I were to create my own list of 36 books it would vary somewhat, but that may be due to the fact that I know little to nothing about some of these. For me that made this set of lectures even more compelling. This is my first Great Courses book, but it will not be my last. I have already purchased two more. I highly recommend that you listen to each lecture in a separate sitting -- giving yourself time to absorb it much the way that you would if you were in the classroom with the professor. 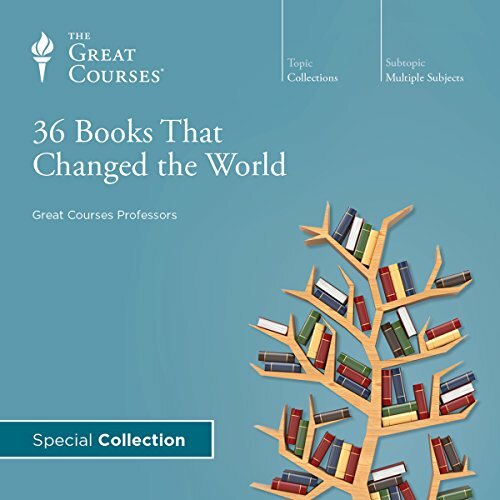 Would you consider the audio edition of 36 Books That Changed the World to be better than the print version? Print version is not available so cannot comment on this. I liked the lectures from the Great Courses of TTC. Some lectures are excellent. The language clear and soothing. Little upset with the 6th lecture, as the presenter was reading the text breathlessly, instead of narrating, unlike other lecturers. I could hear her labored breathing. Yet she wouldn't stop. Never thought hearing could be so tiresome until I heard the lecture of Dr. Elezabeth Vandiver. Stopping after every sentence is very important in audio books and lectures as it takes time to take-in what is heard and make sense of it. Great course, good food for the intellectual mind. It is a great course, helps learn about the origins of literature and some of the other great ideas and writings that we have in our society today. The 36 books varied widely. The lecturers did too. For the most part lecturers well structured and interesting. Felt I did learn new things and was reminded of things I used to know. If you have not had a classic college education this is a very good place to start. If you have these lectures are a good refresher. Or if your education was something in-between these lectures will begin to help you fill in the holes. What constitutes changing the world? Quite liked it, thought the selections for the late 19th and 20th centuries veered too much toward books that had sociological impact rather than intellectual, psychological or philosophical impact. Would have liked Freud. Wittgenstein, Einstein. I would mostly to hear their opinion of it. Other then that not really because I was expecting something a little more. Honestly, when I first looked this up and read the description I will admit that my hopes were high but after I listened to it my hopes diminished a bit because I found myself skipping more rather then listening to them, it was mostly because of their book choices either because I hadn't heard of the book or the book didn't interest.